If you're unfamiliar with Lootcrate, it's a monthly subscription-based service that sends a themed box of geeky goodies right to your door. Most of the time it's... well this is the best description I've read of it. But sometimes it's a little bit better. 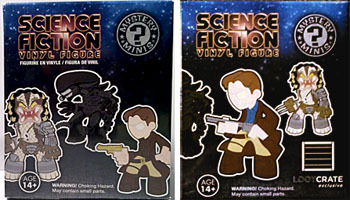 The September Lootcrate theme was "Galactic," and one of the things in the box was a Funko Science Fiction Mystery Mini. The real figures aren't even out yet, but Lootcrate sent a Mystery Mini to all 100,000+ subscribers - and more than that, they sent an exclusive Mystery Mini - Captain Malcolm Reynolds. 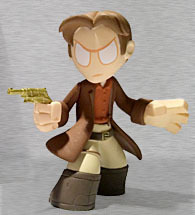 Mal, the studly space cowboy from Firefly, is in the normal series, available in a 1:24 ratio. But that Captain Mal has a different pose and a different weapon. This one is armed with a shotgun - he's holding it in his left hand, with his right hand wrapped around the pump; the standard release is holding a pistol in his right hand, and his left hand is splayed out behind him in a manner most stylish. The head and body on both figures look the same (which makes sense, since the arms are separate pieces glued in at the shoulder), but the paint is slightly different: mass Mal is wearing an orange shirt, while Lootcrate Mal is wearing blue. And of course, he's got his brown coat. In a surprising level of detail, even the packaging has been redesigned. It's not just that the Lootcrate logo is slapped on the front - all the characters shown on the box are in different positions, and the art of Mal shows him with his rifle and blue shirt. 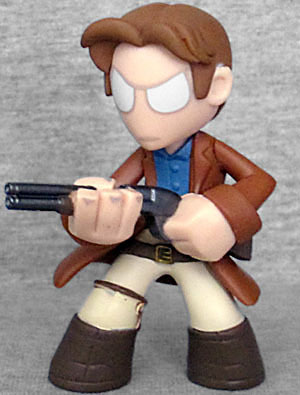 I don't know how many cases of Science Fiction Mystery Minis Funko is sending to retailers, but since every Lootcrate subscriber got this version of Mal, he may be one of the most plentiful Mystery Minis around. Definitely more common than 1:24! 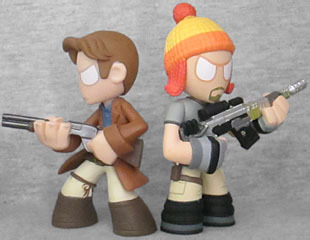 This entry was posted in blog exclusive review, Funko and tagged Firefly, Mystery Minis. Bookmark the permalink. You're definitely right, though, him using a shotgun is unusual. The only times I know of are in "Safe" (a Winchester 1300) and "Heart of Gold" (a Marlin Model 1895 Lever Action) - and conveniently enough, in the latter episode, he's even wearing a blue shirt! I've been pretty pleased with Lootcrate overall. Helps I got lucky with some of the random ones (Megatron from the Loyal Subjects in Transform, Donatello from Heroes, and the Alien from Galactic), but some of their exclusives have been awesome (Funkopop Groot with GLOW IN THE DARK?!?! Yes please).